Creekside Serenade is an adorable 2 bedroom, 1 bath cabin, modest in size but large in personality! Privately situated with a park like setting and a noisy creek running through the back yard makes this the perfect cabin for the couple looking to get away for a few days and enjoy what the mountains have to offer. If you are looking to do some hiking you are in luck since this cabin literally is on the Benton Mackaye trail. Listen to the music of the creek from the spacious screened in porch or relax in the hot tub after a great day of exploring. Enjoy a campfire at creek side with that someone special... don't forget the marshmallows! 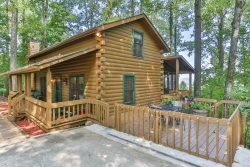 This cabin is convenient to both Blue Ridge and Ellijay so if you want to explore the area, check out both of these quaint little towns which offer unique shopping and fabulous dining. Linens for each bed, 2-bath towels, 1-hand towel, 1-wash cloth per person listed on guest list, dresser or closet for clothing storage, central heat & air, vacuum and/or broom and dust pan, mop, cable or satellite TV, internet, telephone for local calls and propane grill. In addition we provide a complimentary start-up supplies of: Toilet Tissue (2 rolls per bathroom), 1- roll paper towels, 4- kitchen garbage bags, 1- hand soap for each bath and kitchen, dishwasher detergent and dishwashing liquid. Cabin was cozy and in a great private location on a stream with a quick drive to Blue Ridge. Mountain Oasis was very friendly and quick to respond. We loved the guest entry book. It was nice to read others experience and their recommendations. We really enjoyed our weekend at the cabin. It was great to be able to include or dog. Also was awesome being right on the creek and on the benton mackaye trail. It was a perfect size cabin for 2 people, and was in a beautiful setting. As I said before, we really enjoy hiking, and liked having a trail so close to the cabin. Also, we liked that the cabin was not far off the main highway - others that we've stayed in were more difficult to get to, and were farther from the main highway. Cabin was amazing and exactly what we were looking for. Very private with a screened porch, creek, fire pit, jacuzzi, Etc.. Fireplace had a small glitch where the gas would turn off every 10 minutes or so. Maybe needs a new regulator but cabin was so nice it didnt really bother us. We already booked another trip to see the leaves change.